We’d love your help. 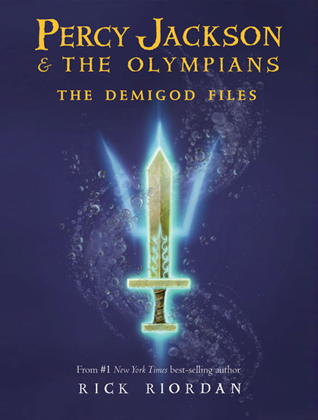 Let us know what’s wrong with this preview of The Demigod Files by Rick Riordan. How do you handle an encounter with Medusa on the New Jersey interstate? What's the best way to take down a minotaur? Become an expert on everything in Percy's world with this must-have guide to the Percy Jackson and the Olympians series. To ask other readers questions about The Demigod Files, please sign up. Serena Among a lot of other things, three short stories one story about the stolen chariot, one about the bronze dragon, and another is the sword of Hades. I'd borrow it from a friend or the library before deciding to buy though. Notes: It’s fast-food fantasy: formulaic fun. Foundational founts of fruitful fodder, framework, and footing for future fiction. Si por mí fuera, leería a cinco autores durante toda mi vida: Rick Riordan, J. K. Rowling, Laura Gallego, Patrick Rothfuss y Sarah J. Maas. LONG MAY THEY REIGN! The Demigod Files es un libro compañero a la primera saga del Tío Rick: Percy Jackson and the Olympians y tiene tres historias cortas y unas cuantas entrevistas para partirse de la risa. La primera historia, The Stolen Charriot nos cuenta cómo Clarisse debe recuperar el carruaje de su padre Ares para probar que es una digna hija de la gue Si por mí fuera, leería a cinco autores durante toda mi vida: Rick Riordan, J. K. Rowling, Laura Gallego, Patrick Rothfuss y Sarah J. Maas. LONG MAY THEY REIGN! La primera historia, The Stolen Charriot nos cuenta cómo Clarisse debe recuperar el carruaje de su padre Ares para probar que es una digna hija de la guerra. El problema es que sus hermanastros, Fobos y Deimos, dioses del terror y el pánico, lo han robado para que ella fracase. Eventualmente, Clarisse se encontrará por casualidad con Percy y juntos intentarán derrotar a estos dioses menores. En The Bronze Dragon todo empieza con un juego de Captura la Bandera en el que Percy y Annabeth están en bandos opuestos, lo que garantiza una competencia brutal. Cuando empieza el juego, Percy y Beckendorf, hijo de Hefesto, se internan en el bosque y se encuentran con unas hormigas gigantes, las myrmekes, que terminan arrastrando al hijo del dios herrero a su hormiguero. A partir de ahí, Percy tendrá media hora antes de que las hormigas devoren a Beckendorf para pedir ayuda a Annabeth y a Silena Beauregard, hija de Afrodita. Juntos, y con la ayuda de un dragón mítico de bronce que deberán ensamblar, estos semidioses trabajarán a contrarerloj para salvar la vida de su amigo. Esta historia me recordó muchísimo a Festus, el dragón que Leo ensambla en la segunda saga y, además, morí de amor por la relación tontita entre Silena y Beckendorf. También me reí un montón viendo cómo Percy y Beckendorf hablaban sobre cómo invitar a las chicas a los fuegos artificiales del 4 de Julio <3. La última historia, The Sword of Hades reúne a los hijos de los tres grandes: Percy Jackson, hijo de Poseidón; Thalia Grace, hija de Zeus; y Nico di Angelo, hijo de Hades. En esta historia, los semidioses son convocados al inframundo por Perséfone, la esposa de Hades, quien los embarca en una misión por todos los recovecos del infierno griego para que atrapen a quien a robado una nueva espada de acero estigio que estaba siendo forjada para el dios de los muertos. Let me preface this review by saying that I love the Percy Jackson and the Olympian Series. I recommend it to kids all the time, and have read the first four books. I did not like this little addition. I have to admit I was mightily turned off by the little Disney logo next to the Hyperion imprint. Intellectual snob? Little ole me? Maybe the Disney thing wouldn't have left such an impression had the pictures included with the text not resembled so many a Disney character. Did Chiron have to look Let me preface this review by saying that I love the Percy Jackson and the Olympian Series. I recommend it to kids all the time, and have read the first four books. I did not like this little addition. I have to admit I was mightily turned off by the little Disney logo next to the Hyperion imprint. Intellectual snob? Little ole me? Maybe the Disney thing wouldn't have left such an impression had the pictures included with the text not resembled so many a Disney character. Did Chiron have to look like Gaston from Beauty and the Beast? Annabeth looks ready for stores shelves as "Tomboy Skipper" (With New Adventures Included!). The stories themselves seemed a bit forced to me. The only thing I really liked about the book was the last segment teasing the reader with a preview of the final book. Riordan's voice seemed more like his own to me there than in the other shorts. Those felt as though he was trying to cram as much action as possible with no storyline to back them up. Cute. And now I'm ready to finally go onto HEROES OF OLYMPUS. WHOOTWHOOT. I'm super excited to read this, and to go on to the next series. Percy is growing up and it's weird, but great. Yes, I know that the Percy Jackson's series was aimed at a younger audience. Yes, I will continue reading and loving them until I am a withered old woman. The Demigod Files is a collection of three short stories, interviews of the characters, fact files of the Greek gods, and activities from Camp Half-Blood. The Demigod Files is more of a companion novel to the series than actually part of the series itself...I think. The book contains various mini-bios on a few of the main characters and gods. As well as a map of the camp grounds and a few other features that are sure to please any fan of the series. In my opinion, the biggest bonuses of the book are the three short stories that it contains. Now, I'm not sure if the stories are completely separate from the overall plot of the series and therefore ha The Demigod Files is more of a companion novel to the series than actually part of the series itself...I think. The book contains various mini-bios on a few of the main characters and gods. As well as a map of the camp grounds and a few other features that are sure to please any fan of the series. In my opinion, the biggest bonuses of the book are the three short stories that it contains. Now, I'm not sure if the stories are completely separate from the overall plot of the series and therefore have no bearing, or if they do play a role in the things to come. Given that the characters present are in line with the most current book out, I'm led to believe that the stories are somewhat a part of the series. In which case, if you are reading the series you should check this book out. Davvero carino; una lettura spensierata, molto scorrevole, veloce e divertente. Divertenti anche le interviste, che ci hanno regalato delle piccole curiosità. I don't know why most of my Goodreads friends rated it kinda low, but I, on the other hand really enjoyed reading it. I loved the mini-stories, especially the one featuring the Sword of Hades. (view spoiler)[Being the lover of spoiler that I am, I sneaked a peek at The Heroes of Olympus and found out that Percy lost some of his memories at some part of the series. So while I was reading this short-story, I thought the reason why he had amnesia was because he fell in the River Lethe. But I was wro I don't know why most of my Goodreads friends rated it kinda low, but I, on the other hand really enjoyed reading it. I also loved the "interviews"! 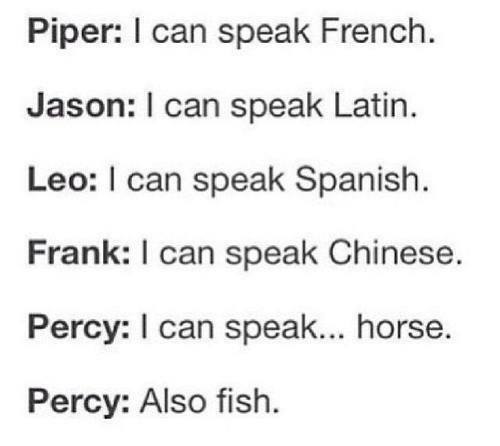 Especially Annabeth's. Percy Jackson and the Stolen Chariot - 2.5 stars: In this short story, we have Clarisse doing a test for her father, Ares. However, her brothers Deimos and Phobos are determined to have her fail, since they don't want a female driving Ares's Chariot. Percy helps her to succeed in her mission and ensure that Clarisse doesn't anger Ares. It was an okay story, with not too much that interested me, but it wasn't bad. I never found Clarisse to be that great of a character, so I didn't really care about her perhaps getting into trouble. Percy Jackson and the Bronze Dragon - 2.5 stars: During their game of Capture the Flag, Percy and Hephaestus's cabin leader come across the head of a Bronze Dragon, previous protector of Camp Half-Blood while trying to infiltrate Annabeth's team. When he gets too close and gets captured by the creatures who discovered it, Percy and company must work to save him. I think this was the one that least interested me, but it wasn't that bad. I do feel like I've read it before though, and I'm not quite sure where. Percy Jackson and the Sword of Hades - 4 stars: Percy, Thalia, and Nico are called into the Underworld by Persephone in order to stop an intruder from escaping with Hades's new sword, one that can free souls from the Underworld. This was my favourite of all the short stories, for a few reasons. It had a good balance of dialogue and action, with some witty bits characteristic of Riordan. It brought together 3 of my favourite characters, especially Thalia. I also thought it was the most fun of the stories, even though it seems to be the most serious. Additional content - 3.5 stars: This part included a few page-long interviews with residents of Camp Half-Blood, as well as Annabeth's bag and a map of Camp Half-Blood. The interviews were cute and short, and I really liked seeing the map of Camp Half-Blood. I never thought about the layout when I was reading Percy Jackson years ago, so it was nice to see. *Yes, I know this is a book made for kids, yes I know it has a cross word, word search, good and goddess guide, drawings of characters, and a guide to packing my own luggage for Camp Half-Blood, but I don't care! I bought this book for myself and myself only, with 0 regrets! *and yes, the short stories were frigging awesome! *Short and sweet, with tons of action! *I loved the automaton in this; I mean, a fully functional, robotic, bronze dragon, crafted in the make of a Greek dragon! Pretty frigging cool! Lemme just tell you: it was so nice going back into the 'early' Percy Jackson days! This novella takes place between the fourth and fifth book of the original PJO series and tells three short stories surrounding Percy and his friends. I'm going to give this story 3 stars, it was fun, but the plot didn't really interest me. Stolen chariot? I feel like we've seen that before... or, after... The publishing dates confuse me okay! I'm gonna give this one a solid four stars. I really liked it and I also found the plot to be more intriguing than in the first story... sorry not sorry. All in all, a really nice and quirky short story! Loved. Loved. Loved. 5 stars! This quest brings together the kids of the 'Big Three', meaning Thalia, Nico and Percy (obviously). I love Lieutnant Thalia and you guys know I'm the biggest Nico girl! So happy to get another glimpse at these two. I also liked the story a lot in this one. Especially one side plot concerning a adorably cute titan (whoever read House of Hades knows who I'm talking about). What?... That's -- nothing I just --- must've caught something in my eye or something. So, in a nutshell: A must read for every PJO fan, I really enjoyed it. I'm still trying to find hints between Nico and Percy though. This review has been hidden because it contains spoilers. To view it, click here. this book contains three stories that will lead you to the fifth book. the first book tells how percy was in fifth period and he heard a noise, when he looked it was clarisse. for an escuse he said he had to puke and it worked.he went to go help her and when it was over he explained that she was driving Ares chariot and her immortal brothers phobos and diemos stole it as a prank. when they ran into phobos and made him tell where the chariot was. when they got there they both had phobos and diem this book contains three stories that will lead you to the fifth book. the first book tells how percy was in fifth period and he heard a noise, when he looked it was clarisse. for an escuse he said he had to puke and it worked.he went to go help her and when it was over he explained that she was driving Ares chariot and her immortal brothers phobos and diemos stole it as a prank. when they ran into phobos and made him tell where the chariot was. when they got there they both had phobos and diemos sepratley in the end they safely got the chariot back to ares temple without him being there. the second story tells how percy was playing capture the flag with his friend beckendorf on his team so as they were in the woods about to attack where they found these dangerous ants it turns out annabeth and her friend selena caught percy but the ants attacked beckendorf. the only way to saved him wasto rewire a bronze dragon but the dragon went crazy and started attacking them and beckendorf stoped it. the third story tell how percy was tacking a exam and percy dog came asking him to follow it when he got there he ran into thaila and nico then they fell trough the earth to the underworld. they talkd to persophone about hades new sword being stolen and they had to find it when they started looking for the theif they came across a river that makes you forget things. percy had to wiil it to stay just to let his friends to get throygh so whenhe tried to get through the water fell on him but he was gifted to stay dry in water.when he came out and caught up to the thief who had worked with a titan they threw the tian in the river that makes you forget everything and return the sword back to hades. Now I'm a huge fantasy buff and I understand the Percy Jackson books are intended for children below 12, but still, I wouldn't recommend this to anyone. The dialogue is terribly bad, I hate seeing the greek gods with which I grew up talking like some american teenagers. Yeah I know, this is modern, it's fast-paced, it's supposed to be an easy read for children, get them into books, but not like this. There tons of other better examples (see Harry Potter or The Chronicles of Narnia). This book has Now I'm a huge fantasy buff and I understand the Percy Jackson books are intended for children below 12, but still, I wouldn't recommend this to anyone. The dialogue is terribly bad, I hate seeing the greek gods with which I grew up talking like some american teenagers. Yeah I know, this is modern, it's fast-paced, it's supposed to be an easy read for children, get them into books, but not like this. There tons of other better examples (see Harry Potter or The Chronicles of Narnia). This book has three short stories that describe some of the adventures the main character goes trough. If you look past the terrible dialogue, the stories are not that bad, I particularly enjoyed the second one, about the bronze dragon. Also I don't like the fact that the book has a first person perspective, having a young teenager describe the situations is bad, so bad...maybe a third person narration would have saved a bit. As usual, Rick Riordan delivers. I'm going through his books slowly this year, and it was really nice to see these stories again. The book contains three stories: Percy Jackson and the Stolen Chariot, Percy Jackson and the Bronze Dragon, and Percy Jackson and the Sword of Hades. The book should be read between the fourth and fifth book of the Percy Jackson and the Olympians series (The Battle of the Labyrinth and The Last Olympian, respectively). The book is fun and light. Well, the stories no As usual, Rick Riordan delivers. I'm going through his books slowly this year, and it was really nice to see these stories again. The book contains three stories: Percy Jackson and the Stolen Chariot, Percy Jackson and the Bronze Dragon, and Percy Jackson and the Sword of Hades. The book should be read between the fourth and fifth book of the Percy Jackson and the Olympians series (The Battle of the Labyrinth and The Last Olympian, respectively). The book is fun and light. Well, the stories not so much, but the extra content yes. The three stories can be alternatively re-titled as Percy and Clarisse Can Be Somewhat Civil to Each Other (re: Daddy Issues), Percy and Charlie: The Buff™ (Not) Boys (re: Sneaky Girls Are Sneaky), and The Big Three: Annoyed Again (re: Stop Hurting My Children), respectively. The extra content includes interviews with the characters, questions to test your monster knowledge, trivia, and more fun stuff. “Christmas in the Underworld was NOT my idea. “You stood up to the dragon so Beckendorf would have his chance to jump - now that was brave."